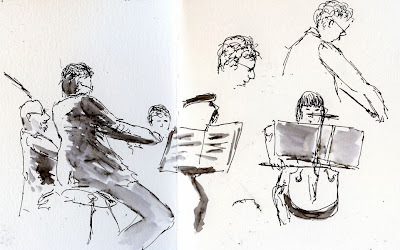 The first time I tried sketching in the mostly-dark was at a concert by City Cantabile Choir last holiday season. It was challenging, but the stage was well-lighted, so I did OK with ambient light. To celebrate my birthday yesterday, my friend Linda invited me to a concert by Kronos Quartet performing at the Neptune Theatre. This time, I wanted to be better prepared for sketching in the dark, so I got a couple of book lights from Amazon.com to try out. One is the GT Max LED Clip-on Light, which is so cheaply made that. . . let’s just say that it’s not worth discussing here. On the other hand, the Mighty Bright Ultra Thin Book Light, while not being of much higher quality, at least has a serviceable clip that attaches firmly to the cover of my “Stefano.” Very compact and lightweight, it can easily be carried in my bag without adding any noticeable weight or bulk. Its mighty brightness is so much so that I was afraid I’d annoy people sitting around me at the concert, so I applied two layers of white tape to the LED bulb, which dimmed it down to the appropriate level. Unfortunately, it casts such a narrow beam of light that I could only clearly see the top third of the page. 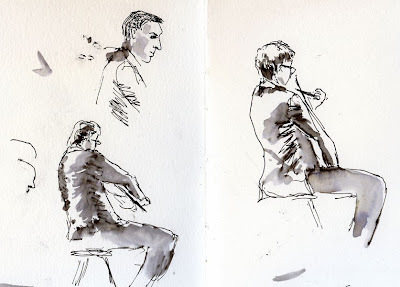 Still, it was better than nothing, especially since my lighting issues were further exacerbated by the Kronos Quartet apparently preferring to perform on a mostly dark stage. Not to mention that the quartet members formed a semi-circle, and I could see only one member clearly – and only his back. Nonetheless, the concert was fantastic – eclectic, Avant-garde music that defies categorization. The Mighty Bright Ultra Thin Book Light was – less than fantastic. I’m going to keep looking. If you have a book light you love that would work while sketching in concert halls, I’m all ears.